thrift store | I'm not stalking you. My son has a Melissa & Doug train puzzle that has caused trouble since the day I picked it up at the thrift store. If you have kids, you may know that Melissa & Doug makes sturdy wooden toys, that can also be a little pricey. If you have read my blog before, you may have gathered that my son REALLY likes trains. Famous last words. She forgot my kid is six months older than hers. Did I forget to mention that it is a SOUND puzzle? I put batteries in it Christmas morning after my son opened it. I was convinced for days that it didn’t work. I finally figured out that it only makes the whistle sound when you put in all the pieces at the same time. We discovered that it worked off of light sensors in the puzzle. When they all sense darkness, it makes the noise. And how did we discover this? Oh. Crap. That stupid train puzzle. Every night one piece is missing. Every night I never think to check. Every night I have to hold my breath as it whistles in the darkness, hoping that it will not disturb any man, child, or beast already in slumber. 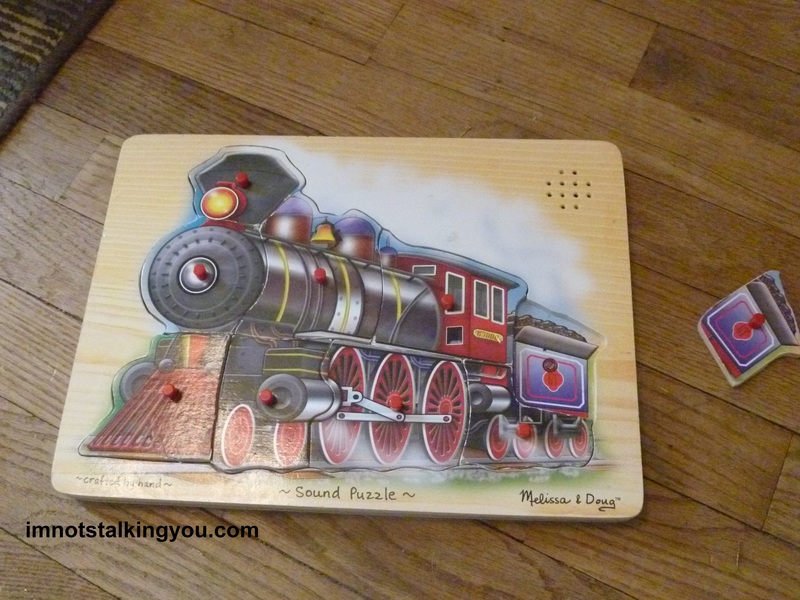 Posted in A day in the life and tagged child, Melissa and Doug, puzzle, Santa Claus, sound, steam, thrift store, toy, train, whistle, wood. Bookmark the permalink.